Make sense out of life. One of the most exciting and influential areas of science today, biochemistry and molecular biology (BCMB) exists at the intersection of biology and chemistry. Exploring the cellular and molecular building blocks of living organisms is a fascinating — and humbling — experience, as you uncover the very conditions and interactions that make life (and you) possible. Our biochemistry and molecular biology major puts you on the fast track to discovery, allowing you to engage in research as early as your first year, co-author research papers with faculty members or graduate students, and present those papers at professional conferences. Whether you choose to enter the industry or pursue an advanced degree, you’ll graduate ready to hit the ground running. Why Study Biochemistry and Molecular Biology at Clark? 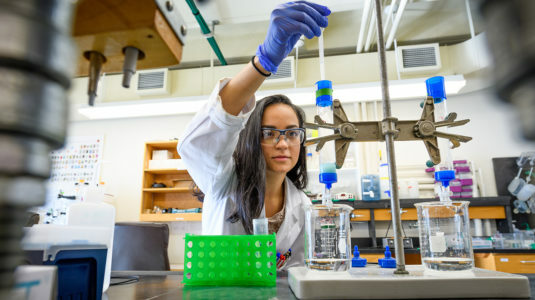 Pursue your degree — and valuable internships — in a region with a national and international reputation for excellence in biomedical innovation and education, including the University of Massachusetts Medical School and biotech companies that are right here in Worcester. Combine traditional “wet lab” biochemistry with chemical, biological, and computational tools to solve biology questions. Conduct research in Clark’s LEED Gold-certified Lasry Center for Bioscience, a 50,000 square-foot, state-of-the-art facility, and use specialized biology and chemistry research equipment normally found only in much larger departments. The biochemistry and molecular biology major is highly structured and requires a solid grounding in biology and chemistry, as well as courses in physics and calculus. 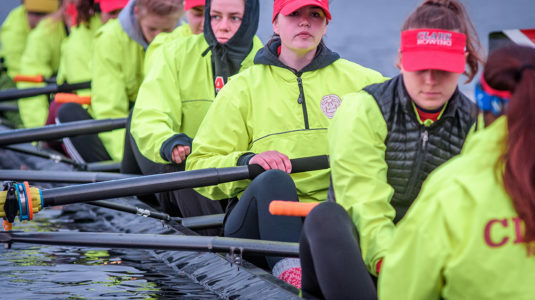 You also will take biochemistry, a yearlong course sequence that reviews our current understanding of the field, before moving on to more advanced courses, one of which must fulfill a techniques requirement. Our robust Pre-health Advising Program is available if you’re interested in pursuing a career in the health professions. 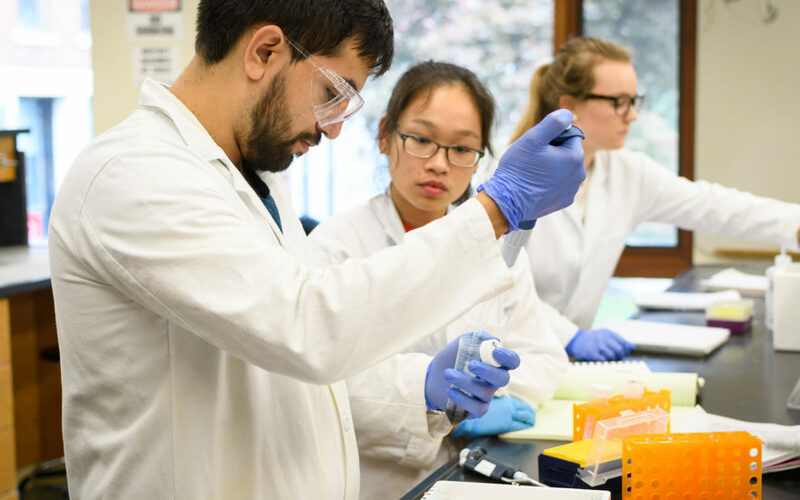 Learn about our biology and chemistry facilities and equipment available for teaching and research, and the resources at Clark’s Carlson Science Library. At Clark, your education extends beyond the classroom. LEEP Center advisers can help you choose from a range of opportunities that complement your coursework and let you put your biochemistry and molecular biology knowledge into practice. The biochemistry and molecular biology major is designed to help you learn outside the classroom. Many students take advantage of internship opportunities during the academic year or over the summer to connect what they’re learning with their professional development. Some students choose to intern at Worcester’s University of Massachusetts Medical Center and frequently find that such experiences can lead to summer fellowships or admission to graduate or medical schools. In alignment with Clark’s LEEP philosophy, participation in a Study Abroad and Away program is an opportunity to gain world and workplace experience to complement your on-campus experience. Clark approves semester, yearlong, and summer opportunities to earn credit through academic coursework, internships, community-based learning, or research. Explore our Study Abroad and Away page, where you can search programs by academic interest, location, and language. After you’ve identified some appropriate programs, ensure they fit into your four-year plan by talking with your faculty adviser as early as possible. 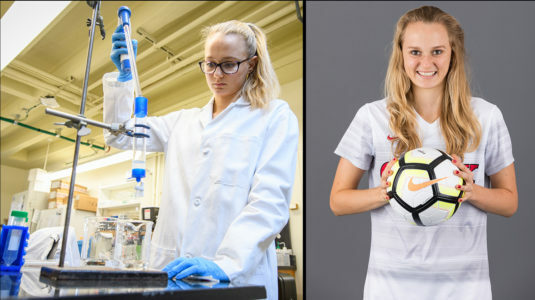 Clark is committed to action-based learning, which means that as an undergraduate you can join faculty and graduate students in their research. Our faculty members have research interests in these subfields of biochemistry and molecular biology, among others: molecular modeling, protein chemistry, cell division, enzymology, signal transduction, molecular evolution, computational genomics, and gene expression. Join other BCMB, biology, and chemistry students, both graduate and undergraduate, at weekly seminars sponsored by the Chemistry and Biology departments, featuring a variety of research topics. The opportunity to conduct research in an active laboratory can be a defining experience of your undergraduate education. Participation in research shows you real-world applications of classroom knowledge and skills, and provides invaluable experience whether you want to pursue a career in industry or go on to medical, veterinary, or graduate school. You can get involved in research in different ways. You might conduct research as part of a research course or internship, or participate informally in faculty research during your spare time. You can also apply to our summer research program. Typically, about a dozen students each receive a stipend of $3,000 – $3,500 to live on campus for 10 weeks while working with a specific Clark faculty member. Another option is to apply for funding to support your own research on a project of your choice during the academic year or during the summer. Kokil, A., Renna, A. *, Kumar, J., and Granados-Focil, S. “Synthesis and Characterization of Triazolium Iodide Ionic Liquid Electrolyte for Dye Sensitized Solar Cells.” Journal of Macromolecular Science, part A, Polymer Chemistry, 2011, 48: 1022. Wu, H., Canfield, A. *, Adhikari, J., and Huo, S. “Quantum Mechanical Studies on Model a-Pleated Sheets.” Journal of Computational Chemistry, 2010, 31: 1216–1223. Zellers, R. G.*, Drewell, R. A., and Dresch, J. M. “MARZ: An Algorithm to Combinatorially Analyze Gapped n-­mer Models of Transcription Factor Binding. BMC Bioinformatics, 2015, 16: 30. Research involvement at this level provides you with an excellent background for future graduate work in biochemistry and molecular biology, and a breadth of experience that will assist you in future work in the allied health, teaching, or other science-related fields. Aaron Bogle discusses the biochemistry research he presented at Fall Fest. With a biochemistry and molecular biology major, you can attend graduate school to further your knowledge of the field, or to train as a health professional (doctor, dentist, veterinarian, nurse, physical therapist, physician’s assistant, or pharmacist). The major also provides an excellent foundation for those wanting to pursue a career in forensic science, intellectual property law, or K-12 teaching. Warren Alpert Medical School at Brown University, Providence, R.I.; M.D. University of Massachusetts Medical School, Worcester, Mass. ; Ph.D., M.D. Harvard University School of Dental Medicine, Boston, Mass. ; D.M.D. Our nervous system enables us to learn, remember, think, and experience emotion. Explore how these critical systems develop and function—especially in mammals—and their relationship to behavior and disease. Gain experience using software packages to analyze chemical and biochemical systems retrieval, such as analysis of DNA and protein sequence information, and simulations of protein dynamics and ligand binding. Explore how currently available drugs interact with biological systems at the molecular level to combat a range of infections and diseases, and read journal articles to see examples of drug development research. This lab-oriented course will have you making (recombining) new DNA from two or more existing DNA strands, often from different organisms. You’ll deploy a range of techniques as part of a semester-long project.